As the Merrium Dictionary defines it : Something that indicates or fixes a limit or extent. 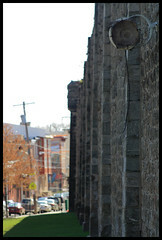 This is the perimeter of historic Eastern State Penitentiary in Philadelphia.. Cool picture, but not a place I want to visit.